heliosolaire offers you the complete range of HYUNDAI photovoltaic modules at competitive prices. The HYUNDAI solar modules of the G series available in polycrystalline and monocrystalline offer ranges of power up to 360Wc. All photovoltaic equipment has the following certificates: resistance to degradation induced by potential (PID), corrosion by ammonia, saline medium, high temperatures and abrasion of sand. The power of HYUNDAI polycrystalline photovoltaic panels changes for the RG series from 250 Wp to 265 Wp and up to 300 Wp in monocrystalline for the RI series composed of 72 cells the powers go up to 320 Wp in poly and 360 Wp in mono . 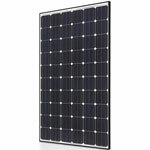 The panels are also well suited for applications connected to the network for large-scale photovoltaic projects such as agricultural roofs and for applications on isolated sites. 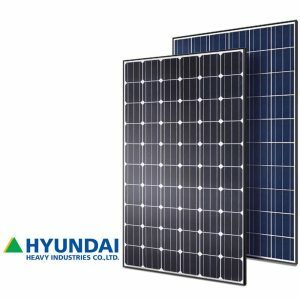 The Hyundai RG photovoltaic module is a high-performance 60-cell solar panel equipped with PERL (passivated emitter, rear locally diffused) technology, suitable for the large roof project or solar power plant on the ground. The Hyundai RG photovoltaic range is available in multi-crystalline from 250 to 265 Wp and in monocrystalline from 275 to 300 Wp. TUV_Certificate_MG_MF.pdf The Hyundai RI photovoltaic module is a 72-cell high performance solar panel equipped with PERL (passivated emitter, rear locally diffused) technology suitable for the large roof or solar power plant project. The Hyundai RG photovoltaic range is available in multi-crystalline from 310 to 320 Wp and monocrystalline from 330 to 360 Wp.